In the present study (i) the impact of plant Boron (B) status on foliar B absorption and (ii) the effect of B complexation with polyols (sorbitol or mannitol) on B absorption and translocation was investigated. Soybean (Glycine max (L.) Meer.) 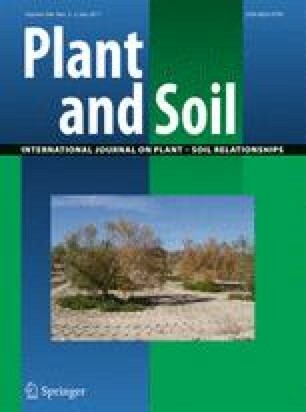 plants grown in nutrient solution containing 0 μM, 10 μM, 30 μM or 100 μM 11B labelled boric acid (BA) were treated with 50 mM 10B labelled BA applied to the basal parts of two leaflets of one leaf, either pure or in combination with 500 mM sorbitol or mannitol. After one week, 10B concentrations in different plant parts were determined. In B deficient leaves (0 μM 11B), 10B absorption was significantly lower than in all other treatments (9.7% of the applied dose vs. 26%–32%). The application of BA in combination with polyols increased absorption by 18–25% as compared to pure BA. The absolute amount of applied 10B moving out of the application zone was lowest in plants with 0 μM 11B supply (1.1% of the applied dose) and highest in those grown in 100 μM 11B (2.8%). The presence of sorbitol significantly decreased the share of mobile 10B in relation to the amount absorbed. The results suggest that 11B deficiency reduces the permeability of the leaf surface for BA. The addition of polyols may increase 10B absorption, but did not improve 10B distribution within the plant, which was even hindered when applied a sorbitol complex. The authors acknowledge the German Research Foundation (DFG, SFB 564, TP 3.2) for financial support.